In addition to Worst Cooks in America on Food Network, we also recently got hooked on Secrets of a Restaurant Chef. I can't decided if Anne Burrell terrifies me or amuses me - I think both. Her hair is kind of crazy! Recently we watched an episode in which she made Shepherd's Pie and Mushroom Soup with Bacon. Since we aren't as skilled as she is in the kitchen , we decided to tackle just one of those for dinner over the weekend: the Shepherd's Pie. I always thought Shepherd's Pie meant beef, but this recipe uses lamb. I also thought it meant ground meat, but the lamb was diced boneless shoulder or leg. I think the diced lamb is what made me agree to try this. 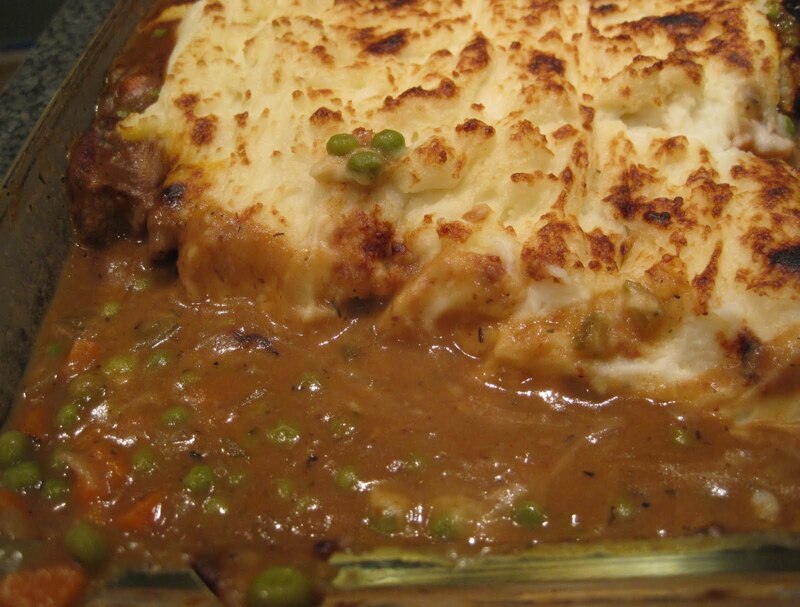 Ground beef shepherd pie has never much excited me. There aren't many photos because I was busy dicing onions (instead of leeks), carrots, and celery while SP browned the lamb. After browning the lamb, it was simply a matter of sauteing the veggies and then adding all the ingredients (chicken stock, tomato paste, thyme, bay leaves, red wine, peas) and letting it simmer for an hour. While it simmered, SP made the mashed potatoes. 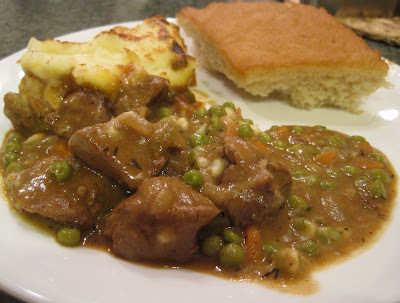 The lamb and veggies are poured into a baking pan, the mashed potatoes layered on top, and then the whole thing is broiled until the potatoes are browned. It was delicious! 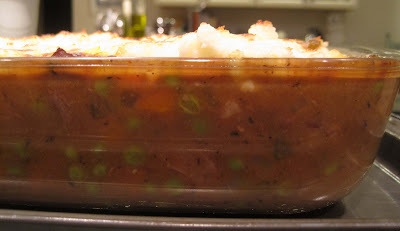 I usually think of shepherd's pie as kind of bland - mushy veggies, a boring brown gravy, overcooked meat. But this sauce was very tasty, probably thanks to the thyme and red wine, and the veggies weren't all mushy. The lamb was nice and tender and flavorful. We'd definitely make this again! And, for us, it's a great dish because we now have three more meals ready to enjoy. So dinners will be easy (just reheat it in the oven).